^ a b Rasmussen, Carmen; Andrew, Gail; Zwaigenbaum, Lonnie; Tough, Suzanne (2016-11-20). "Neurobehavioural outcomes of children with fetal alcohol spectrum disorders: A Canadian perspective". Paediatrics & Child Health. 13 (3): 185–191. ISSN 1205-7088. PMC 2529423. PMID 19252695. 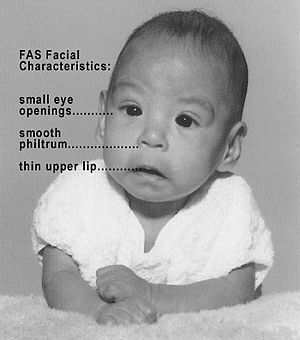 ^ a b c d e f g h i j k l m n o p q r s t Institute of Medicine; Committee to Study Fetal Alcohol Syndrome (1995). Stratton, Kathleen; Howe, Cynthia; Battaglia, Frederick C., eds. Fetal alcohol syndrome: diagnosis, epidemiology, prevention, and treatment. Washington, D.C.: National Academy Press. ISBN 978-0-309-05292-4. Archived from the original on 11 March 2016. ^ "Pregnancy and alcohol: occasional, light drinking may be safe". Prescrire Int. 21 (124): 44–50. Feb 2012. PMID 22413723. ^ Oba, Peggy Seo (2007). "History of FASD". FAS Aware UK. Archived from the original on 2017-01-04. Retrieved 2016-11-20.